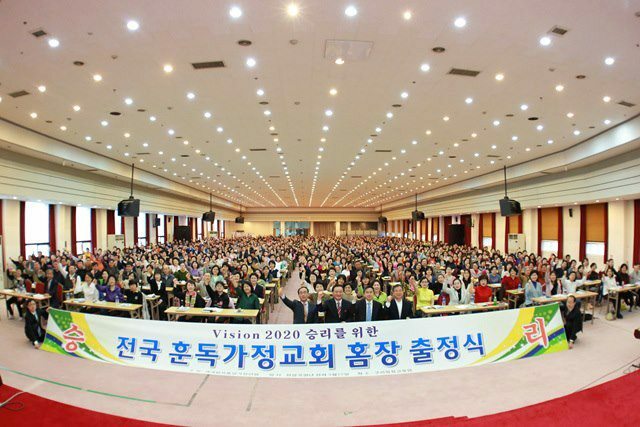 More than 1,600 people attended the “National Leaders of the Hoon Dok Family Church Workshop for the Victory of Vision 2020” held in Guri Training Center in Seoul, Korea on April 20-21, 2013 and April 27-28, 2013, according to a report on Tongilgyo.org. The main goals of this workshop were to create anticipation for the victory of “Vision 2020” that True Parents pronounced and to provide education on the practical applications to have a successful Hoon Dok Church, which is the core strategy of Vision 2020. The theme of the workshop was “Let’s settle Cheon Il Guk through spreading Hoon Dok Church.” Homejang (translated as leaders of Hoon Dok Church), vice leaders of Hoon Dok Church and leaders of national missionaries attended the event. At the first workshop there were 845 people in attendance and 865 people who participated in the second workshop. At the Homejang education, the FFWPU witnessing education department prepared the lecture on “four cycles”—Witness, Nurture, Blessing, Ministry—for the settlement of a healthy church culture and system. The lecture demonstrated various witnessing ways, examples and methodology. It also presented material such as an invitation to “Happy Day Festival,” witnessing devotion pledge and new witnessing contents (VIP card, mobile witness, 10-second message, open meeting card, witnessing magazine, registration card and one-on-one new member nurture ideology). The education at the two workshops was the opportunity for the leaders of the Hoon Dok Church to recognize the importance of witnessing and spreading Hoon Dok Family Church to achieve Vision 2020. The participants appeared determined to complete the ideal of Cheon Il Guk at the front line with the determination of life or death.